Vlorë is the third largest city and a municipality in Albania. Start off your visit on the 17th (Mon): pause for some photo ops at Muradie Mosque, don't miss a visit to Zvernec Monastery, then appreciate the history behind Independence Monument, and finally step into the grandiose world of Kanine Castle. For ratings, more things to do, other places to visit, and tourist information, use the Vlore trip builder. In October, daily temperatures in Vlore can reach 26°C, while at night they dip to 13°C. On the 18th (Tue), you're off toHimare. 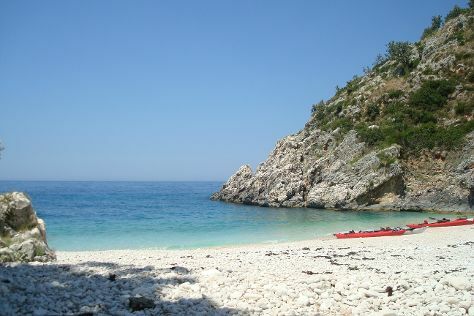 Start off your visit on the 19th (Wed): stroll through Dhermi Beach and then kick back and relax at Spiaggia in Gjipe. On the next day, tour the pleasant surroundings at Jale Beach and then appreciate the extensive heritage of Penisola Di Porto Palermo e Castello. For other places to visit, ratings, traveler tips, and other tourist information, read Himare itinerary maker. Traveling by car from Vlore to Himare takes 1.5 hours. Traveling from Vlore to Himare, you'll lose 1 hour due to the time zone difference. Plan for somewhat warmer nights when traveling from Vlore in October since evenings lows in Himare dip to 17°C. Wrap up your sightseeing on the 20th (Thu) to allow time to drive to Ksamil. 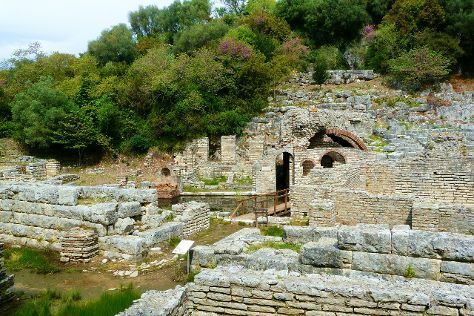 Ksamil Ksamili; is a village and a former municipality in the riviera of Southern Albania, and part of Butrint National Park. Kick off your visit on the 21st (Fri): tour the pleasant surroundings at Bora Bora Beach and then appreciate the history behind Butrint National Park. For traveler tips, other places to visit, more things to do, and other tourist information, use the Ksamil trip itinerery planner. Traveling by car from Himare to Ksamil takes 1.5 hours. In October in Ksamil, expect temperatures between 27°C during the day and 17°C at night.